The activities of the Regulation of Cell Fate (RCF) theme are organized around the central question of how endogenous metabolites control decisions of cell fate. There is an emerging understanding that a subset of metabolites termed ‘hub’ metabolites are critical mediators of information flow within and between cells/tissues. Apart from their metabolic roles, these hub metabolites participate directly in cellular signaling and in epigenetic modification. We aim to uncover mechanisms by which these metabolites control cell fate across biological systems by pursuing the following tracks (i) cell autonomous (using T cells and yeast), (ii) spatially organized 3D organoids (e.g. skeletal muscle organoids), (iii) in vivo model systems that integrate tissue injury and repair (mouse models of lung and skeletal muscle injury), and (iv) physiology and hematopoiesis (in Drosophila). 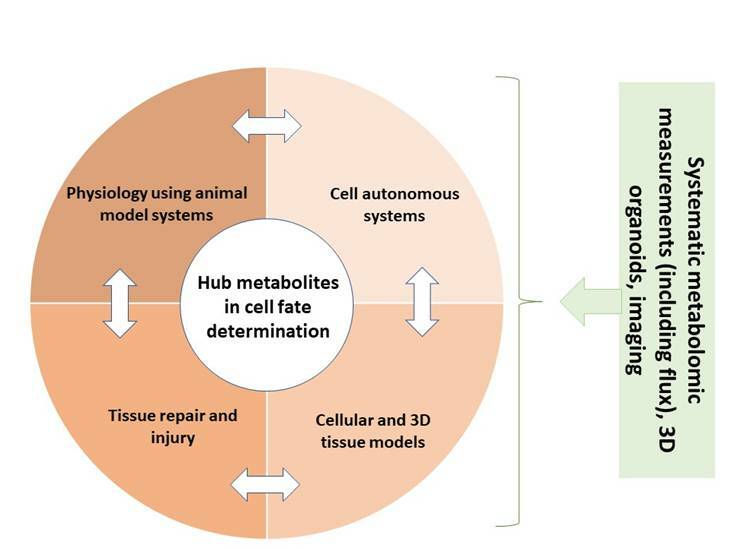 For the analysis of the role of hub metabolites in the regulation of cell fate, the theme is bringing to bear technological and analytical capabilities including metabolomics, metabolic flux analysis, 3D tissue engineering, bioprinting and metabolite imaging. We expect that using an integrative strategy to understand the dynamic regulation of metabolic nodes in these diverse systems will provide a conceptual understanding of how hub metabolites exercise their control over cell fate by regulating cellular/inter-cellular signaling, epigenetics and physiology.